If this is your first time buying a heat pump for your pool, I understand the hesitation. Purchasing a heat pump is not an easy decision to make. 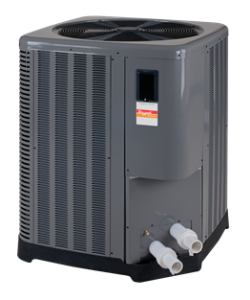 Besides the fact that heat pumps are not cheap, heat pumps are very large, making it difficult to ship back. It’s almost like buying a car, you want to get it right the first time. The good news is that pool owners have so many different heat pump options to choose from. The bad news is that there are so many options to choose from. It’s a catch-22. In this article, we compare our top four heat pumps with the hopes of helping pool owners decide which swimming pool heat pump is best for them. 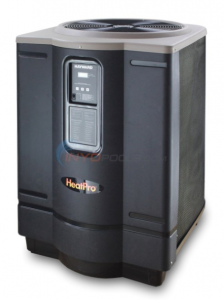 The Hayward Heat Pro Heat Pump is one of our most popular heat pumps. The Heat Pro is designed with an Ultra Gold corrosion-resistant evaporator fin and a profiled fan blade with a heavy-duty scroll compressor. In fact. this combination makes the Heat Pro ideal for harsh coastal weather and it also helps to eliminate noise generated by the heat pump. This heat pump is also equipped with a titanium heat exchanger, making it excellent for saltwater pools and fighting corrosion. The titanium heat exchanger also ensures maximum heat transfer and reduces up to 70% in energy costs. It shipped within a couple of days and delivered quickly. You first notice the quality of the heater construction. The heating in the Northeast in May has worked well and it appears to be very efficient. I would recommend this heater to others. Easy to install with a little plumbing and electrical work. Increased the water temperature within 24 hrs. I’ve had a pool for 20+ years and this is definitely worth the investment. Should have made this purchase years ago. I ordered this heater at the beginning of the season. The delivery was quick and very organized! It was fairly easy to install. We have used it for 8 weeks now and it has run great with no glitches whatsoever. It is easy to use and heats the water quite quickly in our 20 x 40 pool. I have only had one electric bill so cannot comment as to the cost of using the heater. Great heater. Keeps my Kansas pool at 87 degrees all summer long and into the fall. I don’t cover it at night and the temp holds. Would buy again. I live in MA. I hooked my heat pump up at 3:00 p.m with a 67-degrees pool temp. By 7:00 a.m., it was at 80 degrees. Initially, I was worried because I read about how it might take a while before heating up. So far, it is performing far above expectations. The new Raypak Heat Pump boasts as one of the most durable and long lasting heat pumps available. Instead of a thermoplastic outer shell, Raypak equips their heat pumps with a steel case. Raypak also made the heat exchanger out of titanium for even more durability. Raypak heat pumps also make automation easy. Each unit is equipped with features like set timing, energy consumption adjustment, and control over your valves. In fact, Raypak includes these features in every model. One of the best features Raypak offers with their heat pumps is their service. In most of Florida, Raypak offers a same-day service. For the rest of the state, they offer a next-day service. This eliminates the hassle of missing precious time swimming while waiting for a technician. We hired swimming pool technicians to install the heat pump late April in the DC area and it heated up our pool from 62 F to a low 70 in 3/4 days in May. It was lots of fun for the kids to swim in warmer water during the mo ofnth May. The heat pumps heated up our spa to 100 F. We really enjoyed sitting in the hot tub every night. It increased our electricity bill by about $250 to $300 in the month May. It worked as described. Heats my pool better than I expected, I was hesitant to buy a heat pump, but I am very happy with the results. Too soon to know the cost, but it doesn’t run all the time. I owned a Rheem/Raypak heat pump for over ten years which worked fantastically. This new heater seems to heat even better, very efficiently. Easy to install but I can’t believe Rheem didn’t keep the same alignment for the pipe connections. Had to completely replumb the inlet and outlet pipes. Plus, they changed the type of screw on the couplings. Other than those minor setbacks, this is a great heat pump. My last Rheem heater went bad because the accumulator rusted out and it lost its refrigerant. This new heat pump corrected that problem. It appears the accumulator is made of a nonrusting material. Quick delivery, easy to install, works as advertised. Takes a while to heat when the air is cold, but didn’t notice much difference in my electric bill. I just installed this unit last week and had no problems at all with the installation and starting it up. It does take a while to heat up the water compared to a gas heater, but hopefully, it will be much more economical to run. The Pentair UltraTemp Heat Pump is a high-performance heat pump that boasts as the first to use a non-ozone refrigerant (R410A) for operation. The Pentair UltraTemp is also super user-friendly. If an issue arises, the digital LCD screen displays full-worded messages. That means you can say bye-bye to ambiguous error fault codes. The UltraTemp also has auto- set controls that enable the heat pump to shut off automatically once it reaches the desired temperature. In fact, this feature also allows the heat pump to turn the water circulation pump on and off as needed. As one of the most efficient heat pumps on the market, the Pentair UltraTemp meets or exceeds all existing codes and standards. In fact, the BTU and efficiency performances are independently certified by the Air-Conditioning, Heating, and Refrigeration Institute (AHRI). Lastly, Pentair made the UltraTemp’s cabinet out of a long-life, corrosion-resistant composite. This makes it ideal for withstanding the harsh environmental elements. I ordered this heater online because I couldn’t find it locally and couldn’t get an installer. I’m glad I did because the price was great. The unit is quieter than my pump and my AC unit and the electrical usage is minimal. Within the first three months, the “thermistor sensor” broke. Getting through to a very swamped Pentair proved challenging, but once I did, the customer service was fantastic. With a new part installed free to me (warranty in effect), the heat pump was back in business Very efficient heating system. Raises one degree in about an hour in a 40,000-gallon pool. To many, the Jandy Pro Series Heat Pump is one of the best and most modern heat pumps on the market. The Pro Series models feature advanced digital controls, with multilingual capabilities and an auto-heat feature. Also, when you use the Jandy Pro Series heat pump in conjunction with the Jandy AquaLink control systems, you can automatically maintain your pool’s temperature 24 hours a day. With this feature, you can adjust temperatures from your smartphone, tablet, or other web-enabled devices. 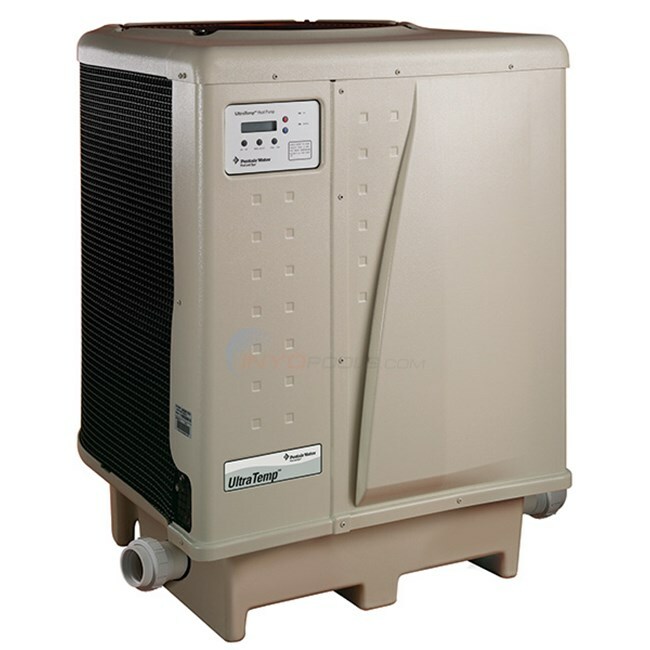 The Jandy Pro Series Heat Pump is popular for their versatility. In each model, Jandy equips the Versa Plumb system. The Versa Plumb delivers the highest energy efficiency through its design. With this system, you will use a lower hp pump and less plumbing pipe and fittings. This also enables the pool owner to install the unit faster and at lower costs. The Jandy heat pump is a little slow, taking a while to get up to speed in terms of producing hot water. But once it gets there, it’s fine. Then there seems to be an awful lot of water around the base of the heat pump and it takes a while to dry up. I brought it to the attention of the installer who explained it as condensation. I said that it doesn’t seem very satisfactory and somebody should have figured out a way to handle that technically. What if I were installing it indoors? Would water simply form a puddle around the heat pump? There’s no answer to that. So, luckily it’s outdoors. But initially, I thought it was a leak. Overall, I’m satisfied with the Jandy heat pump. The heat pump is working great. It does take a little longer to get the heat to rise. Obviously, since it’s not a heater. But once it’s up, especially right now around this time of year, it’s on for only maybe an hour in the morning, when it first starts to get it up to last two degrees. As far as I can see, the price I got it for online was actually reasonable. Heat pumps are maybe a third or more than a regular heater, but that doesn’t count for the cost of the propane that the old one sucked. Even my neighbor switched from propane to natural gas on her heater, and even that didn’t save her much money with her grandkids coming all the time. So she finally switched over to a heat pump about a year or two ago. We have used our heater 3-4 times and the last time we used it we had a huge mud puddle in front of the unit, we had seen this from the previous times. Manufacturing rep came out they are going to send out a guy to make sure no leak. I just cannot see a unit like this putting out that much condensation bit they are willing to check it out. If it doesn’t have a leak, I just don’t know if we can put up with the huge puddles. It heats extremely well, very satisfied with the unit just not the puddles. To help get a better consensus on which heat pumps fare better with our customers, I reached out to our customer service staff for help. 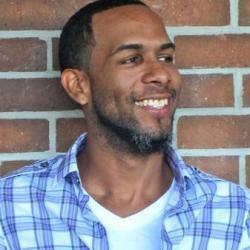 I asked two simple questions that yielded some great information. Between the Raypak, Hayward, Jandy, and Pentair heat pumps, which is your go-to brand? Why? Hayward. Parts are easier to source (locally or online) and they are likely to have a warranty rep in most areas. Hayward. Built in the USA and are very durable. They have a nice warranty if installed by a professional; 5 years parts, 2 years labor, and 10 years on the titanium tube. Hayward – Name recognition; people with a Hayward pump, filter, or chlorinator recognize the name and are drawn to it. Round numbers for BTU sizes; a customer wants to oversize their heat pump is going to choose the 140 instead of Raypak’s 133K BTU. Quality product, there is not a big difference between the Hayward and Raypak in terms of performance and longevity because they both use scroll compressors and similar heat exchangers designs. I’d go with Hayward. The parts are easier to find and technical support is one call away. Hayward or Raypak. They are both great quality at a great price. Also, I notice more Hayward’s sold in Florida than the Raypak. Hayward. They are by far the most common in our market. We sell the most of those, which would lead me to believe that they are the most common in the nation. My go-to is Hayward with Raypak a very close second. What I like about Hayward is that the C.O.P rating is higher than the Raypak meaning it is more efficient. The Hayward has a titanium heat exchanger which is great since it will not rust and this one of the most expensive parts of the heat pump. Hayward seems to have a more extensive warranty service stations meaning that if you have a warranty issue then a service center is typically nearby to anyone in the USA. And the best thing is the price on the Hayward less than any of the comparable brands we carry. Hayward. In terms of BTU size, warranty, and service, Hayward gives you more bang for your buck. Also, more service centers mean less downtime. Is there a particular heat pump that you do not recommend at all? Why? Aquacal. In my opinion, they over-price the units. I usually don’t recommend AquaCal because of the price point. Jandy & AquaCal. Jandy frequently changes the designs for heaters and heat pumps so many times that I hesitate recommending it. In some cases, you’re afraid to recommend something a customer will have problems finding parts for. On the other hand, Aquacal is purely a cost issue. The quietness of their machine does not outweigh their exorbitant price. I do not recommend the Jandy. The parts are hard to find and they make new models very often. Pentair. Many consumer complaints about the quality of their fans. Jandy. I personally see a very small demand for them. I tend to stay away from Pentair. If the heat pump is not installed by a professional then the warranty is no good, even if the heat pump was installed properly. Jandy. Repairs are costly compared to other companies and fewer companies stock the parts. Given these points, I think it’s safe to say that we prefer the Hayward heat pump above all. Sure, overall, Hayward makes great products. however, the heat pump is one of their jewels. When they designed their heat pump, they made sure to keep the pool owners in mind. Keep in mind, all pools are different. If your pool already has a Pentair automation system with a Pentair pump and filter, we recommend purchasing a Pentair heat pump. Sometimes, keeping your pool equipment the same brand gives pool owners extra benefits and features.